Favouritizm welcome the amazing husband and wife soulful production duo of Junior White & Noelle to the label, here with their beautiful and extremely heartfelt song, 'Stay'. The result is a stunning disco tinged slice of dance-floor soul, armed with a mighty vocal and musically wrapped in a lush blanket of warm keys, funky guitar licks and punchy beats. Also on the package, legendary producer John Morales of M+M turns on his retro charm and delivers gold with a scorching ‘80s boogie/house fused production ripe with a hot popping bassline and a delicious piano solo. MKTL aka Master Kev and Tony Loreto give a wink to the early-90s house on their remix with a monster bass hook and emotional strings, layed over jackin' house beats. 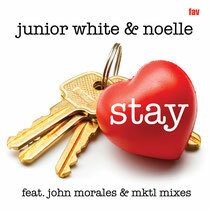 Junior White cooks up some piano house Dub heat, toying with Noelle's vocal and injecting a bumping bass and partaking in some serious Hammond slaying! Pretty much perfect Monday listening to ease you into another slog of a week. Have a listen below.